Microsoft has released Office 2016 suite two weeks ago and I decided to give that a try after using the beta for couple of months now. One of the things I’ve noticed right away is that the new Skype for Business client which is part of the Office 2016 suite is showing the Skype for Business UI regardless of the policy assigned to the user, meaning that if the policy for EnableSkypeUI is set to TRUE or FALSE, the Skype UI is being showed to the user. For Skype for Business Online organizations, you can use the Remote PowerShell in Office 365 to enable your Skype for Business users to use the Skype for Business client or the Skype for Business (Lync) client user interface. The default setting is for users to use the Skype for Business client user interface. If you’d prefer to use the Lync client experience, you can manage the first launch client behavior to display the Lync user interface following the steps later in this topic. NOTE The Lync 2013 client experience isn’t an option for Skype for Business 2016 client versions. Before you attempt to configure your client environment to use the Lync 2013 client, please check the client version to ensure it does not start with the number 16; for example: 16.x.x.x. So if you have installed Office 2016 and the Skype for Business client, please note that changing it to the Lync 2013 UI won’t help is it does not apply on Skype for Business client installed as part of Office 2016 suite. 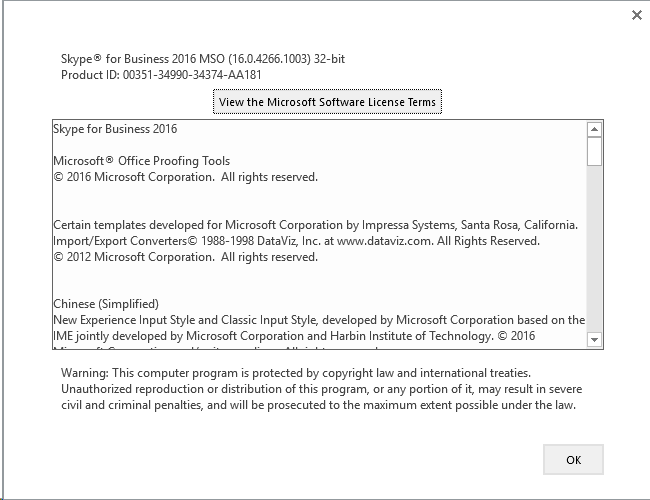 Just a quick question: so there a separate SKU of Skype for Business 2016 and Skype for Business 2015? this applies to the new Office 2016 version of the SfB client, or this applies to the Lync 2013 -> Sfb2015 CU as well? Then this naming discrepancy (Skype For Business 2015 and Skype for Business 2016 are both valid and different products) will be source of huuuge confusion in a matter of weeks! That’s not surprising… Skype for business 2016 isn’t built on Lync 2013. The Skype for business 2015 client is a UI upgrade for Lync 2013 but S4B 2016 is not… its the full Skype for Business client so there would not be an option to revert back to a previous Lync classic UI. this is clearly indicated by the new registry keys created by the 2016 client in office/16 which are outside the office/15 reg key where the 2015 UI key sits. And how can a client “join as guest” if they do not have a S4B account somewhere, but are invited to an old fashioned LYNC meeting (the meeting organizer still uses LYNC server)? S4B only offers a log in with some company credentials.